Hal and Ethel Burton were married on August 20, 1939, in the village of Bishop Falls, Newfoundland. After immigrating to Brooklyn in 1947 and later raising a family in Springfield, Mass., they retired to the Eastman Community outside Grantham, NH, where they have lived for the past 29 years. Before retiring in 1985, Hal worked as a staff nuclear engineer with Combustion Engineering and Ethel worked as a clerk at Mass Mutual. Together they’ve raised three sons and watched their family grow to include seven grandchildren and two great-granddaughters. This past August, they celebrated their 75th wedding anniversary, both at the age of 95. First up, do you have a favorite song? Hal: Oh yes, “I Love You Truly” by Bing Crosby, I think. Ethel: Maybe it was Perry Como — it wasn’t Elvis. 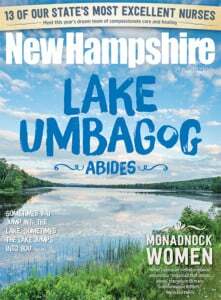 What are your favorite NH activities ? Hal: We’ve thoroughly enjoyed New Hampshire — swimming, skiing, walking. We go swimming in the summer, though this summer we’ve only gone twice. Ethel: It’s just a lovely place. Every Valentine’s Day I carve a heart in the snow for Dad in the back yard with my snowshoes. Any favorite local road trips? Ethel: The drive to Bretton Woods, to go skiing. You designed your own home when you moved here. What were you looking for? Ethel: We were looking for a one-room cabin. Hal: <laughs> We just wanted a country cottage that was simple. Ethel: We bought a piece of land and had the house built on Anderson Pond. Hal: <laughs> Well, not on the pond — on the shores of the pond. We wanted somewhere for our family to visit and to grow old. We’re very happy here. We’re high in the mountains and there are beautiful views. Do you have a stand-out memory of raising your three sons? Ethel: In 1972 we visited our son Gary and his wife, Chris, in Nicaragua — he was with the American school. We took our youngest son Rick down for Christmas and we brought down a Christmas ham, which they couldn’t get down there at the time. Some of Gary’s friends went out for drinks a few days before Christmas, but we decided to stay in and it’s lucky we did because an earthquake hit — we would have been in the heart of the disaster. Six thousand people died. We had to sleep outdoors in tents, and we were evacuated with the families of Marines stationed there. We were flown out on an Army aircraft and made it to Florida on Christmas Eve. Gary stayed on and was promoted at the school, which had to hold classes out in the open air. Hal: Well, just help each other. It’s a give and take. Ethel: And let the husband be the boss, but know that the woman is always right. Hal: We’re aiming to hit Florida in January to visit Ethel’s sister, Barbara, and celebrate her 100th birthday. Then we’ll spend February with Rick and his wife, Barb, in NY. After that, we’ll probably visit our son Peter and his wife, Patti, on Cape Cod. Ethel: Well, we’re both 95. The time is so much shorter. We can’t get half the things done that we’re supposed to. Andrew Burton is the grandson of Hal and Ethel.